What it is: A paint technique that never goes out of style, stencils add drama to any wall and are a great alternative to wallpaper. These days, there are tons of stylish stencils, so don't worry about it looking too '90s. Where it works: Stencils work anywhere you want to add interest with a graphic element. "The technique tends to be used as an accent or border, rather than on an entire wall,You can use stencils behind mirrors, on stairs, or even on part of a wall to give the appearance of wainscotting." When it comes to choosing a stencil, your best bet is to go with something that isn’t too intricate, just in case it bleeds. 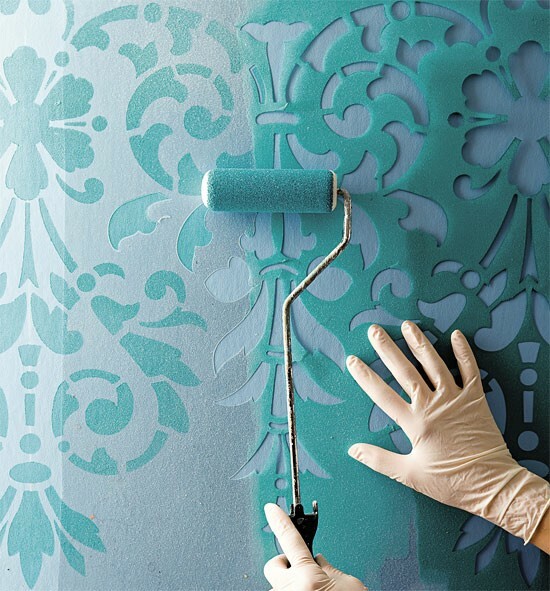 Simply adhere the stencil to your wall and apply the colour. Don’t rely on tape – use a low-tack adhesive spray to adhere the stencil instead And a high-density foam roller works well, just make sure to remove any excess paint to prevent bleeding." Stencils allow you to reproduce a pattern or design over and over again, as many times as you like. These tips will help you get good results. Stencilling brushes are round with short, stiff bristles. Use it in a quick up-and-down movement to dab paint onto your stencil. This helps prevent paint getting under the edges. A sponge or small roller works well too. To use more than one color in a stencil, use tape to mask off areas of the stencil you don't want in a particular color. If you're using various stencils together, first try it out on a piece of paper. It's far easier to find out that something isn't working at this stage and then correct it than when you're painting on your final surface. Old x-rays are great for cutting stencils, so if you're unfortunate to need some, don't throw them away.